The ability to get up off your feet is obviously important in sports like basketball and volleyball. But what about other sports? Well, since your vertical jump is an indicator of your lower-body explosive power (and since lower-extremity strength and power is important for virtually all sports), it’s in every athlete’s best interest to develop his/her vertical jump performance. Get stronger. Jumping is about pushing your body away from the ground. The stronger you are through the hips and legs, the greater the force you can generate against the ground. Exercises like squats, deadlifts (we like using the trap bar), glute-ham raises (on the bench or manual resistance), and Romanian deadlifts should be incorporated into your training plan. Develop your “fast-twitch” muscle fibers. Your fast-twitch muscles are your body’s largest and have the most growth potential. They are responsible for maximum effort jumps, sprints, and lifts. However, to produce movement, your body recruits muscle fibers in an orderly progression from smallest to largest. That means, in order to activate your fast-twitch muscle fibers, you must work at about 70% or more of your capacity (we benchmark at about 80% of an athlete’s 1RM) – heavy weight, low repetitions for most exercises. Contrast training. This strategy will help you accelerate the development of lower-extremity strength and power (and it will also wear you out!). Contrast training involves performing a strength exercise, immediately followed by an explosive movement. An example would be to do a set of squats and proceed, without rest, to a set of squat jumps. Push the Prowler. We love the weighted sled for the development of hip/leg drive, strength, and power. You can push it and/or pull it, and adjust the weight to the needs and abilities of each individual athlete. We use the Prowler as a workout “finisher” for many of our athletes, especially during their off-season training phase. Plyometrics. Once you’ve built a strong foundation through strength training, it’s time to add plyometric exercises to your workout. Plyometric training involves exercises that enable a muscle to reach maximum strength in as short a time as possible, using something called the Stretch-Shortening Cycle (SSC). SSC is basically an eccentric(lengthening) muscle movement rapidly followed by a concentric(shortening) contraction. Examples of plyometric exercises are box jumps, depth/drop jumps, hurdle jumps, and even jumping rope. Steer clear of injury. Vertical jump training should include landing mechanics, since research shows that most non-impact knee injuries result from landing and/or cutting instability. Balance and stability exercises are important additions to any vertical jump training program. Biomechanical considerations, such as knee flexion, knee alignment, and hip motion should be closely observed. Want to improve your vertical jump? Don’t cheat your range of motion when doing the squat exercise. The parallel squat (thighs parallel to ground in “down” position) is more beneficial for subsequent jump performance than the quarter- or half-squat, according to a recent study in the Journal of Strength and Conditioning Research. The authors suggest that the greater the depth of the squat, the greater the increase in gluteus maximus activation and work produced, which is responsible for the increased jump performance. The study also cites an increase in postactivation potentiation as it relates to back squat depth. Postactivation potentiation refers to increased muscular force generation after previous muscular activity. Pre-activity conditioning and warm-up are important across a range of sports, especially for those requiring fast and/or powerful movements. Performance characteristics of muscle are affected by a complex interaction of muscle and nerve fibers. Voluntary muscle contractions performed before physical performance have been shown to increase performance in a phenomenon known as post-activation potentiation (PAP). In other words, you increase the potential of the muscular performance once the muscle has been appropriately activated. Historically, high-load squats (>80% 1RM) are one of the most common exercises for PAP elicitation, as it relates to subsequent jump performance. This article has implications, most obviously, for basketball and volleyball athletes, since a pre-game regimen of repeated bouts of alternating lunges can improve in-game neuromuscular performance as it relates to vertical jump performance (without equipment, weights, etc.). It is reasonable to also expect that lunges may potentiate neuromuscular performance in athletes participating in other sports that require explosive, powerful lower-extremity movements. Plyometrics. Once you’ve built a strong foundation through strength training, it’s time to add plyometric exercises to your workout. Plyometric training involves exercises that enable a muscle to reach maximum strength in as short a time as possible, using something called the Stretch-Shortening Cycle (SSC). SSC is basically an eccentric (lengthening) muscle movement rapidly followed by a concentric (shortening) contraction. Examples of plyometric exercises are box jumps, depth/drop jumps, hurdle jumps, and even jumping rope. 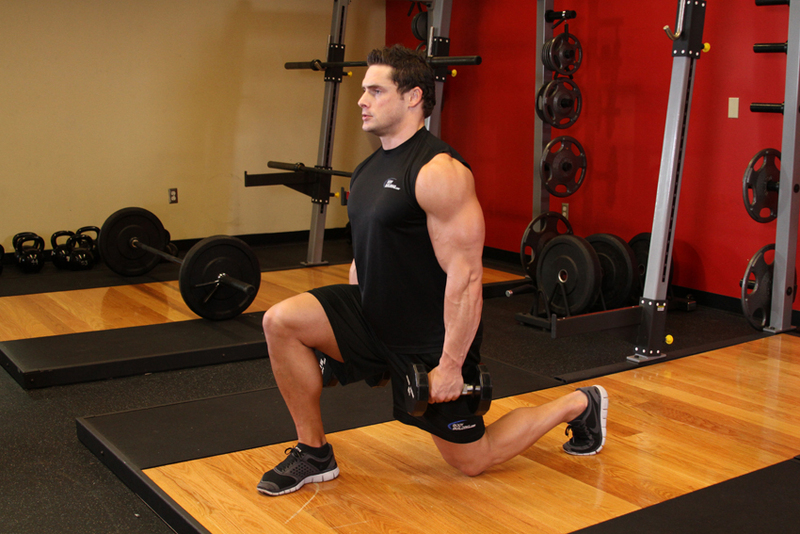 At my facility, we encourage squats — and squat-type exercises — to improve sprint performance. Research has also shown that squats can improve vertical jump and agility performance in athletes who perform the exercise regularly (athletes who swim, throw, and swing can also benefit from squats, which covers just about everyone). Squats are a great choice to build the strength and power necessary to generate force against the ground, which is integral to speed, agility, and jump performance.